One Day In December while sitting on a crowded, stuffy bus Laurie spots a man sitting at the bus stop. Their eyes meet and all of a sudden, Laurie believes in love at first sight. For the next year she and her best friend and flatmate Sarah try to find a way to meet ‘bus boy’ again. So imagine Laurie’s horror when Sarah introduces her to her new boyfriend Jack, the man she’s convinced is ‘the one’ and it is bus boy! She can’t say anything to Sarah and Jack doesn’t either. Over the next ten years, we follow the three of them through various life events, new jobs, house moves, relationships, marriages even, as Laurie tries to convince herself that she thinks of Jack as no more than a friend. The friendship between Laurie and Sarah is brilliantly portrayed. They have such a strong bond and are always there for each other no matter what. Until suddenly something comes between them and at such an important time in Laurie’s life. It was so sad to see how miserable this made Laurie especially when all she was ever trying to do was the right thing. It was almost like a bereavement. I was so desperate for them to get past this and make things right between them again. We all need that friend who is always there for us. At the heart of the story was a love triangle which wasn’t the usual kind of love triangle since two of the people weren’t actual having a relationship. But as with all love triangles, it was an impossible situation. How could this possibly resolve in a positive way for all three? As Jack, Laurie and Sarah’s lives moved on, I honestly didn’t see how things could work out or even how I wanted them to work out. And that’s why I had to keep on reading this late into the night, to find out where Josie Silver would take these lovely characters. As to how it ends, well you’ll have to read for yourself. You may think it’s all going to be straightforward but you might just be surprised by the various twists and turns in the story. You’ll have a lump in the throat for sure at the final scenes. One Day In December is a beautiful story for anyone who believes in true love. It’s a wonderfully uplifting read for any time of the year, not just December. Laurie is pretty sure love at first sight doesn’t exist. After all, life isn’t a scene from the movies, is it? But then, through a misted-up bus window one snowy December day, she sees a man she knows instantly is the one. Their eyes meet, there’s a moment of pure magic…and then her bus drives away. 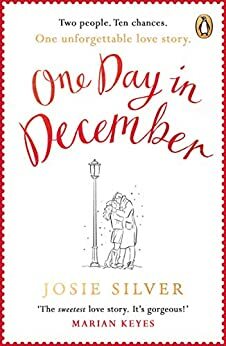 Following Laurie, Sarah and Jack through ten years of love, heartbreak and friendship, ONE DAY IN DECEMBER is an uplifting, heart-warming and immensely moving love story that you’ll want to escape into forever, for fans of Jojo Moyes, Lucy Diamond and Nicholas Sparks.